Transports in the U.S.A information - Liquids in Motion Ltd. Liquids in Motion’s (LIM) USA Division was initiated in 1990 when the company began looking for growth opportunities in the chemical industry. 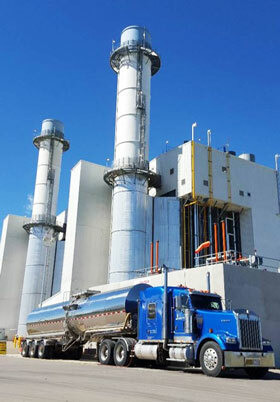 Our first contracts were with several Texas-based chemical companies and started off with one truck specializing in hauling oilfield chemicals from Canada to the USA. With our head office located in Millet, Alberta and a satellite facility in Calgary, Alberta, LIM’s USA Division quickly grew and now services North America from Mexico to Alaska, primarily hauling product between Canada and the USA. LIM is permitted for all states with the exception of Hawaii. Specializing in the transportation of bulk liquid commodities and being hazmat certified, LIM transports a broad range of products including both regulated and non-regulated. As a bonded carrier, LIM takes pride in the coordination of logistics, performing our own ACE (Automated Commercial Environment) and ACI (Advance Commercial Information) e-Manifests and working with our customer’s broker to get loads cleared to cross the border. Our customer service and dispatch is available 24 hours a day. Our highly trained professional drivers are all Hazmat certified and possess FAST (Free and Secure Trade) as well as TWIC (Transportation Worker Identification Credential) cards. They also meet all DOT (Department of Transportation) regulations and have electronic logs. LIM takes pride in the equipment we have to offer. A growing diverse fleet of tractors and trailers are positioned to service the unique needs of our customers now and into the future. 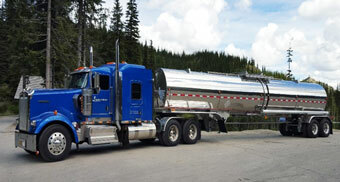 Our trailer fleet consists of stainless steel, fiberglass, aluminum and lined tankers. All stainless steel trailers have in-transit heating capabilities. Our trucks are equipped with GPS satellite tracking devices as well as pumps and compressors to meet all specific loading and off-loading product requirements.